Science Simulations: NEW! Now your students can perform hundreds of simulated lab experiments in a virtual lab. Discovery Channel Theater: Five fast-paced fact-filled video voyages in both English and Spanish. Library: Updated World Book Encyclopedia features extensive reference and research materials. Laboratory: New Assessment Component! Interactive activities focus on building critical learning skills. Multimedia Studio: Creative tool complete with slides, text and cool sound effects allows students to create their own multimedia presentation. Updated with Lesson Launchers—ready-made slide shows to start teaching your next science topic. Where can you find an electronic overview of the splendor of our Earth? 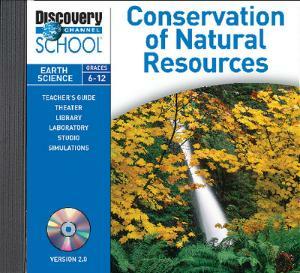 It's all a few clicks away in this incredible Natural Resources CD-ROM. Video Adventures include Introducing Conservation, Sustainable Architecture, Colored Cotton, Living Machines, and Pet Clothes. It also features hundreds of printable photos and articles, hands-on explorations, multimedia presentations, and movie clips on renewable and nonrenewable resources, recycling, preservation and restoration, sewage treatment, and even endangered species. Includes a Teacher's Guide. Simulations include Energy Consumption, Solar Energy, Ocean Ecosystems, Beach Erosion, and Scientific Inquiry.